A two or three days ideal escape from Siem Reap, its amazing temples of Angkor Park but also its hordes of tourists and dusty, noisy traffic jams, Battambang is one of our favorite cities in Cambodia. With around 200,000 inhabitants, the third largest city in the kingdom has three bonuses: a remote French colonial atmosphere, an authentic way of life still unspoiled by mass tourism despite the proximity of Thailand and Siem Reap... and the most beautiful girls in the country. We were almost forgetting to mention its fourth bonus: The Maisons Wat Kor. We visited this “specialty lodging” (such a marvel can't be called a hotel) on personal recommendation. And also after checking the reviews on Tripadvisor, ranking atop any further accommodation in the whole region. We already knew the place by reputation. 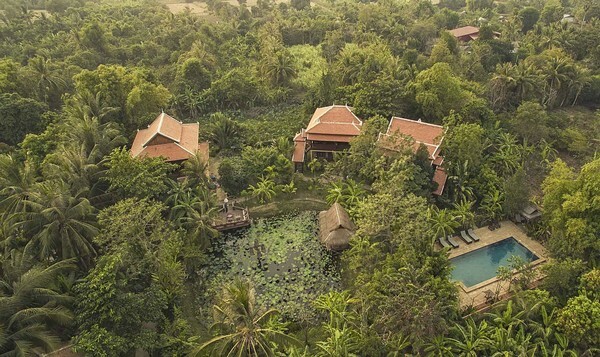 It is world famous since Brad Pitt and Angelina Jolie made Maisons Wat Kor their home away from home during a few weeks. We actually booked in their house (there are four of them, plus two under construction), though this is not what motivated our visit. They left (but promised to come back), and this was our turn to be a star! This is such a small structure. 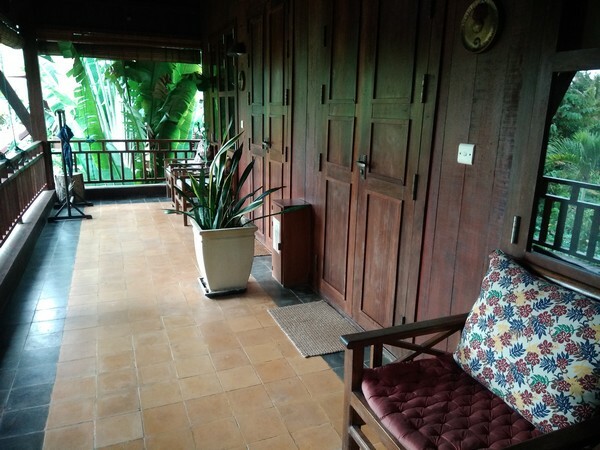 With a maximum of 40 guests sharing the houses (divided in two ground floor plus two upper floor rooms), we could see from the very first minute that everyone was treated like personalities by the kindest staff in the region of Battambang. Stepping in the hidden Maisons Wat Kor, located in a rural part of Battambang, yet not far from the city center, when Kim Nou and Sophea, the owners, greeted us as old friends, we knew that we were dropping our luggage at the right place. In a little Paradise, actually. As nice as their hotel homepage can be, it can't reflect the delightful atmosphere at The Maisons Wat Kor. The plentiful tropical birds, mixing their happy songs with the frogs' love ritual after a cinematographic sunset. 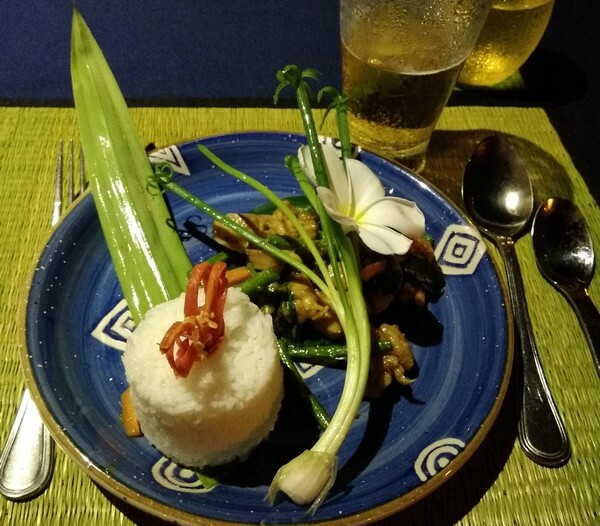 The perfume of the flowers, which you will taste in your plate accompanying the light, tasty, sometimes slightly spicy specialties served in the small restaurant which Angelina and Brad enjoyed every day with no special request at all. The fruits, everywhere, and particularly the best mangoes in Asia, 100% organic like everything served at the gourmet guests... No picture, no pen can describe what this Garden of Eden can procure. Let's call this ecstasy. The villas are isolated enough from each other to allow a complete intimacy. You might share your floor with a neighbor, unless you book two rooms (this will be the case if you travel with children or friends), or the whole house. 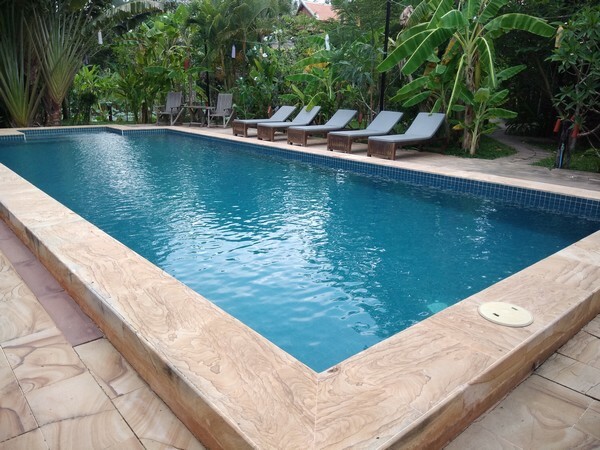 Which is not a big deal, at approximately USD 120 only per room. Angelina Jolie privatized the whole hotel for the price for one night into a junior suite in a London or Paris palace hotel. 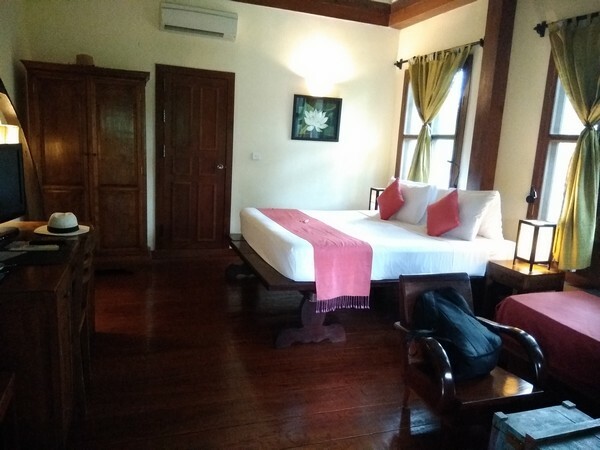 The air-conditioned rooms are designed in a Khmer regional style. Elegantly rustic, with a lot of carefully selected, legally traded old wood. The furniture is local, lovingly designed, as simple as elegant. We liked the ancient cabinet, displaying the refined essence of tropical wood and wax. Everything was immaculately clean. No dust despite the nearby laterite paths. No dead insect, though we were surrounded by preserved flora and fauna. We could work on the large writing desk, on which we found a complete tea facility, but no coffee. It was not omitted. Kim Nou and Sophea are born gourmets, and prefer to invite their guests for bio-coffee, produced in a very small quantity in the area of Battambang. 90% of the coffee served in Cambodia is industrial, imported from Vietnam. We got powerful and tasteful shots of the rare local blend as often as we wished. And tea alike. Served in style, in lovely fine china pots. Those small little notes of private attention are a realistic approach to luxury in a rural atmosphere. What else?! 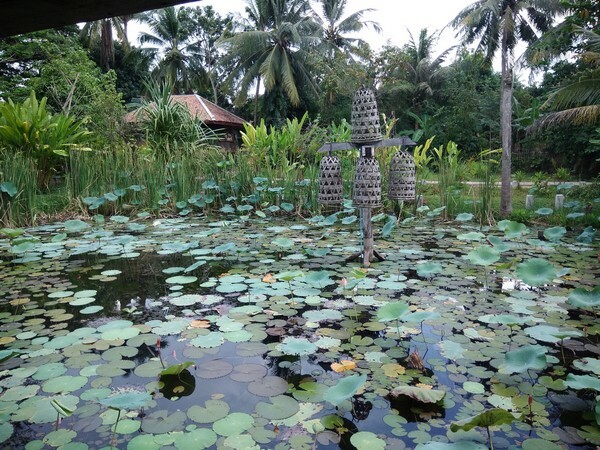 We spent four days at the Maisons Wat Kor. Did we feel bored? Not at all. We could relax, read, work a little bit on our computer (Wi-Fi was not super high-speed, but more than OK for a provincial city), and didn't even find time to watch the multi-channel TV. There is a pool. It is one of the most lovely in Battambang. Very reminiscent of those glamourous 1960's pools on the French Riviera. 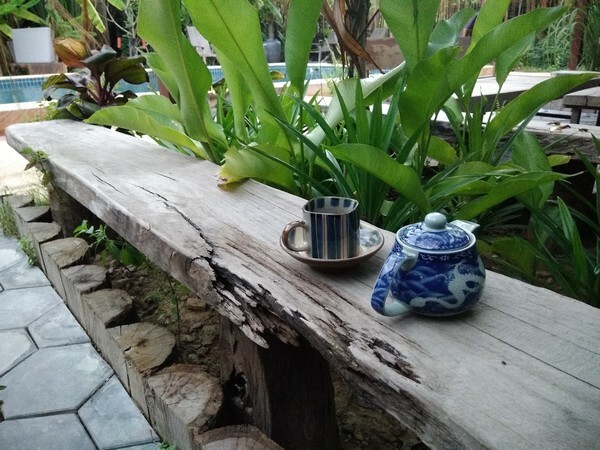 Each time that we used it, the staff came with a pot of ginger tea to cure a cold which we caught in the over-air-conditioned Phnom Penh to Siem Reap night bus. That was so anticipating. Last but not least, Kim Nou is a captivating stories teller, and his tragic yet exciting adventures during the amok Khmer Rouges reign should inspire a movie... and they did, as Angelina Jolie pasted some of them in her movie “First They Killed My Father”. Which precisely happened to our host. There is a small open-air SPA located beside the lilly pound. Local masseuses, trained in the secular of Khmer massage, provide their services at a fair fee. 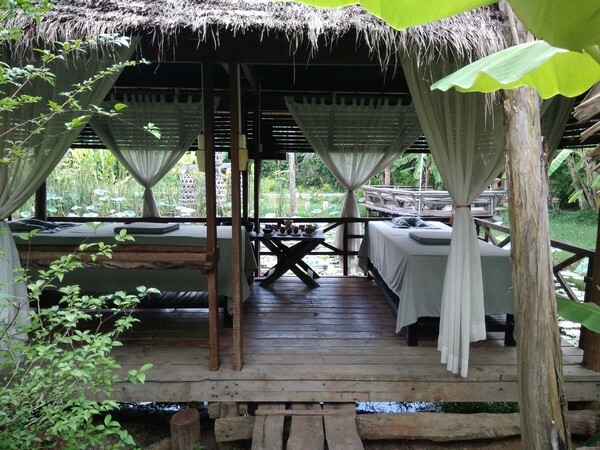 Two massage tables have been set in this serene location, ideal for a couple treatment. For the anecdote, it alternatively served as a classroom for Angelina and Brad's children, who hired teachers from the French school in Phnom Penh. The children occupied the first floor of a villa -that was ours- easy to recognize from the picture hanged on the ground floor where the couple set his home away from home. This is of course the most demanded "maisons". Gastronomy occupied much of our leisure. We liked to sit at “La Terrasse du Lotus”. For breakfast, we always preferred the Khmer option. featuring juicy mangoes or bananas from the garden, farm eggs, and other ingredients coming from the local Psar Leu, Psar Boeung Chhouk, or the colonial Psar Nath Battambang markets. We have always been served generous portions but, like for lunch and dinner, more rice, vegetable, juice or fruits can be ordered at no extra charge. We skipped the lunch, as we always felt quite full after breakfast, and always had dinner at the breezy terrace. The set menu was updated every day, of course. We discovered dishes which we never experienced anywhere else, despite our repeated trips to the kingdom. For instance the delicate “Banana Blossom Salad with Chicken”, or the sappy “Winter Melon Soup with Pork”. Desserts were either fruit, or coconut based delicacies like “Green Beans & Coconut Milk”. Lunch and dinner can be served in the villas at no extra fee. Lunchboxes, made of palm leaves, with food wrapped in banana or lotus leaves (the Maison Wat Kor policy is 100% plastic-free), are ideal for those going on an exciting tour in Battambang and its region. Guests like to join the Cambodian Cooking class, starting with some early shopping in the colorful Battambang markets. 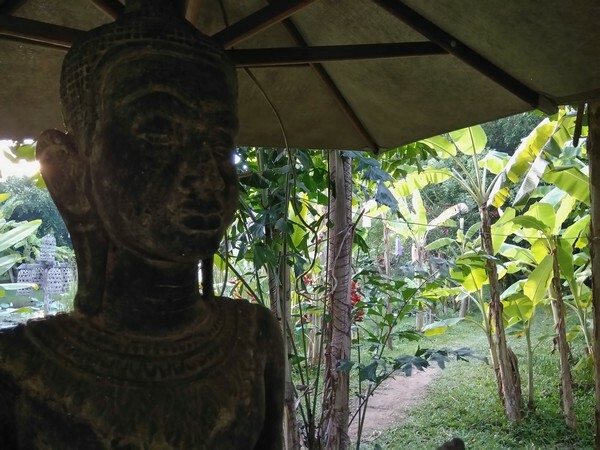 What do in Battambang? More than what you would ever imagine. First of all, rent a bike. Kim Nou will assist you on this. This is a cheap, sportive, and so practical way to discover the colonial city. Stop where you like, and meet the extremely welcoming local population, waving you along the always picturesque, sometimes bumpy and dusty streets and paths. We liked cycling along the River Sangker, visit the Ek Phnom temple, observe the happy kids bathing in the muddy waters. The city is famous for its bamboo train: a basic wood flatbed on wheels, using a unique rail track across breathtaking forests and rice paddies. It operates quite far from the lovely colonial railways' station: the slow -extremely slow- operation is restarting from Battambang to further cities nearby. The old, basic third class cars are tracked by a Czechoslovak locomotive. The highlight of the city center, besides its plentiful of temples, remains the nicely restored French mansions and townhouses around the 1930s central market. We loved wandering in the animated section of the river, between the Royal Residence and Thmor Thmey Bridge. Feeling lazy? Do it by tuk-tuk. 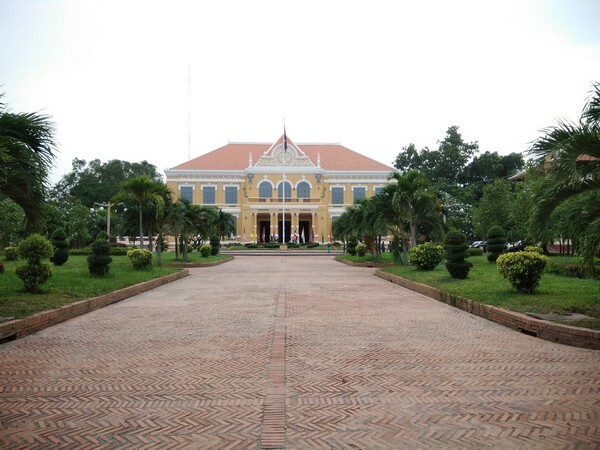 The Maisons Wat Kor charges only USD 35 for up to four passengers. Excluding entrance fees to some attractions like Phnom Sampeou and bats cave, or the vineries nearby.